​Why are people buying and selling websites? What type of people buy drop shipping websites? How do you make and sell a 6-figure website? That’s exactly what I’m going to talk about in this blog post– buying and selling websites. Specifically, what ​it's like buying and selling drop shipping websites, and how you can make yours more valuable. Before we dig in, I need to mention that this post will cover buying and selling drop ship websites using the Drop Ship Lifestyle model, which typically uses Shopify as a platform. And the reason why I’m covering this topic is because a ton of people have been asking us some really good questions about building and selling six figure online stores. This topic was previously covered on my YouTube channel, Drop Ship Weekly. Watch the video below, and make sure to subscribe so you don't miss out on the latest eCommerce strategies, news, and trends! One question that’s often is asked is if we have any of our own Drop Ship Lifestyle stores for sell. And the answer is no. We have never made any offers to our members​. The reason is when we build stores, they're not small investments because they turn into real assets. This is something I didn't know at all when I first got started with eCommerce way back in 2007. ​It wasn't until I sold my first network of drop shipping stores in 2012 that I realized how valuable these things actually are. So ​if you're on the buying side, looking to get started in eCommerce, but don’t want to start from zero, I'll talk about how you could do that. And if you're on the other side, and you've built up a site with a healthy profit that you're looking to sell your website, I'll talk to you about that. You’ll learn how you can prepare for selling your drop ship website when the time comes. Where Do People Buy and Sell Websites? So the first thing I should talk about is where do these transactions actually happen? Where ​do people buy and sell websites? Well, there are a lot of different marketplaces out there. Some of the most popular ones are self-serve. That means you can go on these websites and basically list your website for sale on your own. You can do it as an auction– think of an ‘eBay for websites’. In fact, people actually do buy and sell websites on eBay. It's one of their categories. But the important thing to know with any of these self-serve platforms is you’re typical going to have smaller sites for sells. You’re not going to have sites that have been vetted by any type of third party. Which means anyone can say, "Hey, I have a website making X amount of dollars, here it is, it's for sale for this much." So, then the unsuspecting website buyer goes out and buys the store not really know what they're getting. Even worse, they don’t even know if the person selling it to them is 100% legit. The buyer won’t even know if the numbers are real and won’t know it’s a scam until too late. That's the sad truth. If you're serious about buying or selling valuable eCommerce websites​ then I would recommend using a brokerage. ​Specifically, one that has curated listings and an actual team behind the sell and purchase of each website. A curated listing means not any website will be listed. A good brokerage company will actually go out there, check the analytics, verify the numbers, and do everything they can to make sure that the site that’s being listed is a real business. So the brokerage I’m going to cover in this post is run by some good friends of mine​. You’ve probably heard of them even if you haven’t been following this blog for a while. In my opinion, they are the most legit website brokerage online right now. So anyways, the company is called Empire Flippers, and they’ve been around for several years. In the beginning they were called AdSense Flippers, but a lot has changed since those days. Over the years, they’ve built a massive business that features a highly curated marketplace of websites for sell that have been vetted by their team. ​On track to sell $35 million in 2018. ​Overall, $53+ million in online business sales. ​Winner of multiple industry awards from IBBA (International Business Brokerage Association). ​Made the Inc. 5000 list for the fastest growing companies in America– three years in a row! So, you want to know how much your website is worth? Empire Flippers has an easy tool to help you find out. Head to their website, and click on “Try Valuation Tool” at the bottom of the page. You’ll answer a few questions regarding such things as views, business type, and age of your business. In return, you’ll have a solid number of what they think your website is worth– and what you could potentially sell it for. Now, if you’re looking to buy instead of sell, Empire Flippers has a tool to help you with that as well. Referred to as the “Marketplace”, this is a curated list of websites that Empire Flippers currently have for sale. Whether you’re serious about buying or curious about what’s available, this where you’ll want to start. When you head to their website, you’ll see a link for “Marketplace” at the very top of their page, go ahead and click. On the next page you can search for current listings, new listings, and recently sold listings. You’ll see what eCommerce model they’re using, monthly net profit, established date, price, and niche. Some listings even include a seller interview. One thing you won’t see is the URL. Obviously, that is to ward off potential shady people that are just looking to rip off existing sites. What's unique about Empire Flippers is they interview some of the sellers. So if you see a microphone next to the listing, you can click on it and listen to the team at Empire Flippers actually interviewing the business owner. This will help you to learn a little bit more about ​the business to see it's a good fit for you to buy. It’s a nice little bonus that makes you feel a bit better about buying an online website. It’s fun to browse around and see what stores are making ​how much. Below is an example of a drop shipping site that's in the furniture niche. It's making $36,146 net profit a month and selling it for $1.3 million. How are Online Websites Valued? What it comes down to, typically, is how much money these websites are making each month. This isn’t how much in sales, it’s how much in net profit. Which is then multiplied by a number, which becomes the selling price, or 'List Price'. 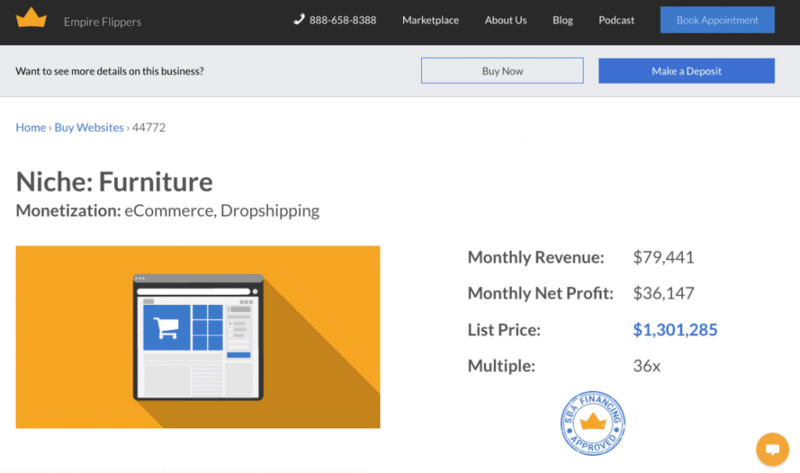 ​In the past 12 months, they’ve sold 26 drop shipping stores. ​With over $3 million in transaction value. ​The range of stores they’ve sold in the past 12 months is between $30,000 and $530,000. ​The multiples for these drop shipping stores are averaging around 27x (22x - 30x is most typical for all eCommerce models). ​Now how are the multiples determined? There are a few factors that determine if ​a valuation multiple will be high or low. One of the factors that determines the value of your online website is potential risk. For the new buyer, what are they putting their money into when they buy ​an online store? One way you can determine risk is how long has the website been established? How established is the business? Is there a track record of success? Along with consistent sales? How about those sales… are they trending up? Staying flat? Obviously if sales are trending up, and if it's been consistent for two years, ​there would be a really high valuation on ​the drop shipping store. On the other hand, if someone's been in business for six months, and their sales are kind of spiky and not consistent, well that store is not worth as much because it's more risky. Another thing that determines the value of your website is how diverse is your traffic? If you have an online store and want to sell it, but the bulk of your traffic comes from Google organically (or search engine optimization), that’s not so good. It makes it super risky for the buyer​. Mainly, as mentioned ​earlier, what happens if Google de-indexes your website overnight? Then your store won’t be making money anymore. So the more ways you have traffic coming into your store, the better. That will have a huge impact on the valuation of your store because it reduces buyer’s risk. A big factor in a online business’s value is time. How much time is the new buyer going to have to spend to keep this business profitable? What skills do they need? This is a major factor when buying and selling websites because people are investing a lot of money into these stores. And most of them aren’t looking to buy themselves an 80 hour a week job. That means if you have a business that has a lot of employees or virtual assistants along with a good automation system in place, you’re probably only working a few hours a day, a couple times a week. That type of business is much more appealing to a potential buyer than a website that requires around the clock care to keep things afloat. So the more you can take yourself out of day-to-day tasks, the higher your website’s valuation will be. Since valuation is based on net profits, and not sales, expenses are a huge factor in your website’s value. When you’re starting to think about selling your website, ​you'll want to start cutting some expenses. If you have any ads that aren’t profitable, or just breaking even, it’s time to turn those off. If you’re running experiments and spending money to do so, you’ll want to to close those out. Basically, anything that isn’t leading to more profits should be cut. As your monthly net profit goes up from these cuts, your store’s sales price will increase as well. One thing Justin brought up during his talk at our recent retreat was selling websites that are drop shipping from China. He mentioned that he has sold plenty of sites that use the China model, but right now, things are changing. There are some issues going on with different tariffs, potentially a trade war, and even increased shipping costs. So those websites, right now, have more risk involved on the buyer’s end and in turn are taking longer to sell. Empire Flippers could still do still help you sell your drop shipping store if you’re doing so with Chinese suppliers, so still reach out. At the retreat though, he showed some real world examples of websites they’ve sold that use the Drop Ship Lifestyle model. Our model is all about working with domestic suppliers versus drop shipping from China. And it’s no surprise, but stores using the Drop Ship Lifestyle model sell a lot faster and get a lot higher multiples than other drop ship models. So, if you're watching this right now, and you're drop shipping from China, definitely consider shifting your business model to the Drop Ship Lifestyle model. It’ll help you in the long run should you ever want to sell your drop shipping website. But you never know… Something might come up in your life and you need money. Or you have a new project that you want to invest your time in. Justin even told the story of one couple that sold their store to help them with the costly expense of adoption. Even if you’re thinking that you will never want to sell your drop shipping store, you should still be building and operating it to sell. Should that day ever comes, you’ll have an asset to cash out. ​If you’re looking for further reading on building stores to sell, I highly recommend picking up, “Built to Sell” by John Warrillow. Grab it from Amazon here. ​What Drop Shipping Niches Sell for the Most Money? One cool detail that’s listed in the Marketplace, is the niche of the store. It’s not specific, but they do list the broad category, which can be an extremely helpful tool if you’re just getting started choosing a niche. When you’re on the Marketplace page, click the “Sold Listings” tab and you’ll see what niches are selling, what they are selling for, what the net profit is, and when they were started. Justin shared with us at the retreat that some of the drop shipping stores they sold were in high-ticket niches, and some were in low-ticket niches. The largest drop shipping site they've sold in the past 12 months sold for $533,000, And the sites up in that tier include apparel and accessories, home and garden niche, sports, home decor, automotive industry, art, and so on. Some of the ​low-priced sites they've sold were in the technology industry, home furnishings, toys and games, kitchen and dining, outdoors. What’s important to know about which niches are selling for the most money, is some niches are more valuable than others. Like I mentioned earlier, so much goes into website valuation based on how long the sites have been around, how risky they are, and how much money they make. It’s interesting to see data on what niches are selling and for what, but it’s important to keep in mind that the niche is just one factor behind a website’s valuation. Whether you’re getting ready to buy or sell an online business, I recommend heading to Empire Flippers and checking out their website. You can read up on some pretty interesting stories and data, not to mention their blog is full of great resources for this. Again, full disclosure, I'm good friends with these guys, I think they have an amazing business, and I recommend their services to our members because I trust them. They've proven themselves by selling $54 million of businesses (so far), and at the very least I'd recommend coming here, going to their marketplace, going through all the different sites, listening to the interviews. If you want to see websites that have been sold in the past, even if it’s just to get an idea of what your business is worth, go to Sold Listings. Or if you go to their Valuation Tool, you can enter information about your online business, whether it's drop shipping or not, and it will tell you what your site they think is worth. To wrap things up, there’s plenty of different reasons why you might want to buy or sell a website. On the other hand, why do sellers want to sell? And if you don’t know whether you want to sell your site or ​now, I still recommend building a store that’s valuable. It’s a great way to get going and to have a safety net in place when you need it​. From personal experience, I’ve seen a lot of our students at Drop Ship Lifestyle sell a store when they’ve had multiple stores running and one of them starts to take off. So, they sell the ones that are still profitable, that are great businesses, but that they'd rather just get the payout​ to then reinvest into the one that's taking off. As you can see there's lots of different reasons to buy, lots of different reasons to sell. Again, I think ​Empire Flippers's tools are a great starting point, so go check them out! 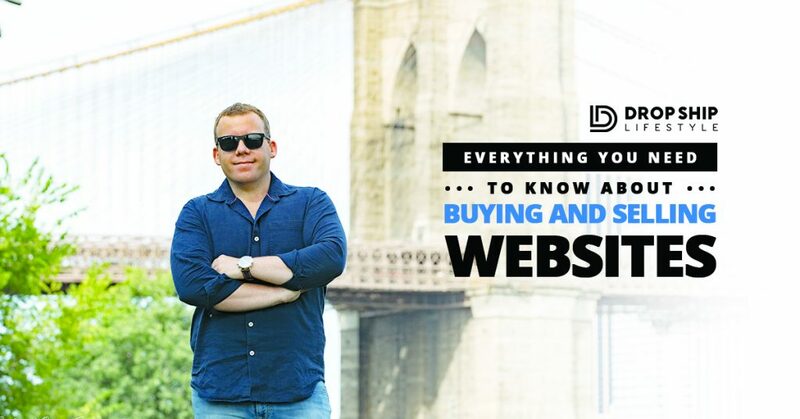 Hopefully this gave you an overview on buying and selling websites, but as always leave me any questions below! Also, if you’ve ever sold or bought an online business, I’d love to hear your story and any advice you have for first-timers.